The Hunstman's Hall public house (owned by the appropriately named 'Punch Pubs') has courted more than its fair share of controversy over the years. Highlights include a 14-year old boy getting his jaw smashed outside the pub, and two nights of consecutive violence and serious assaults on customers in June 2005, with local police reporting a climate of fear and reluctance of the public to come forward with information for fear of reprisals. This culminated in the enforced closure of The Huntsman's for several nights, to prevent a repeat of these violent incidents. 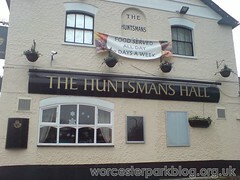 Things looked, for a while, to be on the up, with the Huntsman's under new management and redecorated and the distinct absence of the blue-light disco every Friday and Saturday evening. Even The Brinkster recently made it through a meal at this establishment and seemed pretty positive about the whole experience. "Friday night there was another huge ruck with a customer admitted to hospital with head injuries. After a row, a group were found kicking the man in the body and then his head. He was unconscious for a few minutes but was released from hospital the following morning." Let's hope this is just a blip, as Worcester Park can ill afford a return to the old ways - and The Huntsman's Hall can ill-afford any more points on their late licence. In the meantime, don't have nightmares. Do sleep well.